Rockstar Pure Zero Energy Drink is a zero calorie beverage from Rockstar Energy, the 3rd largest energy drink company. Pure Zero originally launched with 160mg per can, but now contains 240mg of caffeine/16 fl.oz. can. Pure Zero is Rockstar's contender against Monster Energy's Absolutely Zero line and Red Bull's Total Zero. 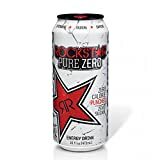 I recently picked up a few cans at 7-Eleven to give Rockstar Pure Zero a try. Silver Ice: This one is a mix between Squirt Soda and Fresca. Not as sweet as Squirt but sweeter than Fresca. It has the same crisp grapefruit/citrus flavor, which I've always found appealing. Punched: This reminds me of a carbonated version of Hawaiian Punch, but not as sweet. Of the two, I prefer the Silver Ice since I find that flavor more refreshing. Three artificial sweeteners are used to give Pure Zero a more sugar-like taste and it succeeds pretty well since there is just a slight aftertaste. Erythritol, Ace-K, and Sucralose make up the Pure Zero sweetener trifecta. Nothing new with the energy inducing effects of Pure Zero. Expect the same lift as regular Rockstar except for no sugar rush. Unlike Monster Absolutely Zero, Rockstar sticks with their standard energy formulation for Pure Zero. Monster went a tad lower in caffeine for their Zero Line @ 135mg per 16 fl.oz. can. Overall, Rockstar Pure Zero Energy Drink is a solid product and should do well for Rockstar. With the recent reformulation of Pure Zero to 240mg of caffeine per can, due diligence should be exercised to ensure that these don't fall into the hands of children. 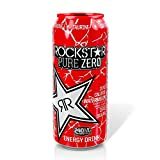 4 Pack - Rockstar Pure Zero Punched - 16oz. Carbonated water, citric acid, erythtitol, taurine, sodium citrate, benzoic acid, caffeine, acesulfame potassium, glucuronolactone, sucralose, sorbic acid, pantothenic acid, niacinamide, inositol, natural flavor, milk thistle extract, gum arabic, ester gum, pyridoxine hydrochloride, panax ginseng root extract, guarana seed extract, caramel color, cyanocobalamin. How Does Rockstar Pure Zero Energy Drink Compare? Rockstar Pure Zero Energy Drink contains 15.00 mgs of caffeine per fluid ounce (50.72mg/100 ml).